Blyth Town FC take on Hebburn Town on Saturday as they make their debut in the Northern League second division. The club successfully upgraded to the Northern League after winning the Northern Alliance premier division for the third time last season. The match kicks-off at Town’s South Newsham ground at 2.30pm. 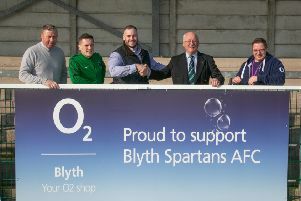 Blyth Town manager Mick Connors said: “After four years, we finally have our dream of Northern League football. “To be honest, it hadn’t sunk in until we left the changing room on Saturday before the pre-friendly against Blyth Spartans last week and saw the number of people who had turned up, it suddenly made the sometimes horrendous moments we have all had to suffer over the past few years disappear. “We are delighted to be able to welcome Hebburn Town to our ground for this proud moment. We have played against each other before in a friendly at their ground four years ago when we lost 3-0, so hope we can do the business on Saturday against a team I believe will be pushing for promotion come next April.